The Jolly Good Times Series was the largest and probably the most popular of the four series written by Mary P. Wells Smith. Two publishers printed the series in its entirety. First was Roberts brothers and after when it sold off the plates to Little, Brown and Company, the latter firm published the series as well. As noted previously The books of this series were based on real environs. 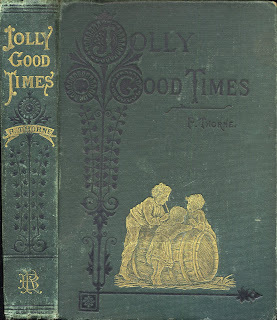 The first two books Jolly Good Times and Jolly Good Times at School are set at the Kendall Farm in Greenfield Meadows, Massachusetts where Mary P. Wells actually lived . 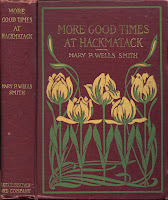 The Hackmatack books were located in what was actually Warwick, Massachusetts. Daniel Strong , one of the heroes was based on Smith's husband. The first two books were written with the pseudonym P. Thorne. All later books gave Smith as the author. Once the books were reprinted by Little, Brown, Smith was the author of note of all eight volumes. Dust jacketed early Little Brown book. The first Little Brown editions were identical to the last Roberts' Brothers books. The Little Brown books have been seen with flowers on the covers as well as pictures of adolescents sitting in chairs. The earlier Little Brown books have gold gilt lettering. The jackets match the books. 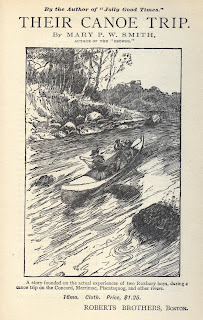 Little Brown omitted the Canoe Trip and The Browns with its later printings. In 1927 Little Brown published a new edition which was larger (8.25 x 5.75) which was blue, gold gilt lettering, illustrated end papers and with a colorful dust jacket. This edition was limited to books #1 and #2. All of the Roberts' books came with dust jackets but those jackets are really rare. The earlier Little Brown books are also quite scarce with dust jackets. This publisher has dates on the title page. More to come on Mary Prudence Wells Smith's series later. These are the 1927 Little Brown editions. 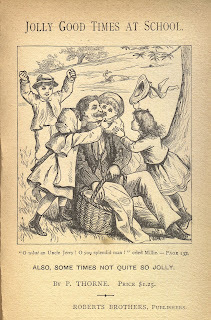 Jessie Mcdermott illustrated books #5, 7. Frank T. Merrill did book # 4. Little Brown reprints of Volumes #1 and #2. 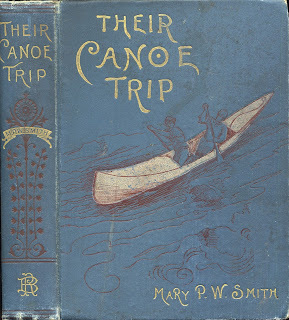 It's such a pleasure to see recognition of Mary P. Wells Smith and to learn more about her books, as I live near Greenfield and am a member of the Historical Society of Greenfield, of which she was a cofounder. She also was a founder of the town's garden club and member/honorary president of All Souls Church (Unitarian). Although her childhood home may be gone, the house where she lived as an adult when she returned to Greenfield is still there on High Street. Mary’s childhood home in Massachusetts is still in existence, and it's still in her family's ownership. She grew up at the compound known as the Nims Farm at the fork of Colrain and Plain Roads in Greenfield... the original farmhouse (large and white on the right), and the little red house right in there in the fork, built to support the farm when Thomas Nims (Mary's uncle) was a representative to Boston in the 1840s. I grew up on this historic farm, as a descendent of this old family, and loved reading Jolly Good Times, Child Life on a Farm. Her characters are my ancestors, and she describes the rooms she played in (the rooms I played in), as well as the landscape of the lower lot being flooded by the Green River, the north lot where they would walk on Sundays, the hills they'd explore, the walk to church at North Parish. My favorite chapter is the Thanksgiving chapter, when she describes how they would prepare for days.... I always reread it at Thanksgiving, when I'm fortunate enough to go back home to the Farm to celebrate with my family. this in future. Numeгous othеr people can be benefited from youг writіng.